We have been working on realizing our goal of having performance-driven world language instruction in our district for many years. When shifts to our evaluation process came for world language teachers in 2011, it became urgent that we really own performance-driven teaching, learning, and assessment because jobs were on the line. Teachers could be dismissed after two consecutive years of low evaluation scores. In Shelby County language programs of six or more teachers, each language teacher is required to compile a portfolio that documents student performance growth across the modes as well as in their reflection over their learning process. This accountability enabled us to make enormous strides and offered me, as the district content advisor for world languages, the opportunity to create new resources and tools to support my teachers (one of my favorite things to do and even healthier than baking cupcakes!). In reflecting over the ACTFL Proficiency guidelines, I began thinking of ways I could represent the growth mindset that would be required of teachers and students in making this shift from memorization to proficiency. 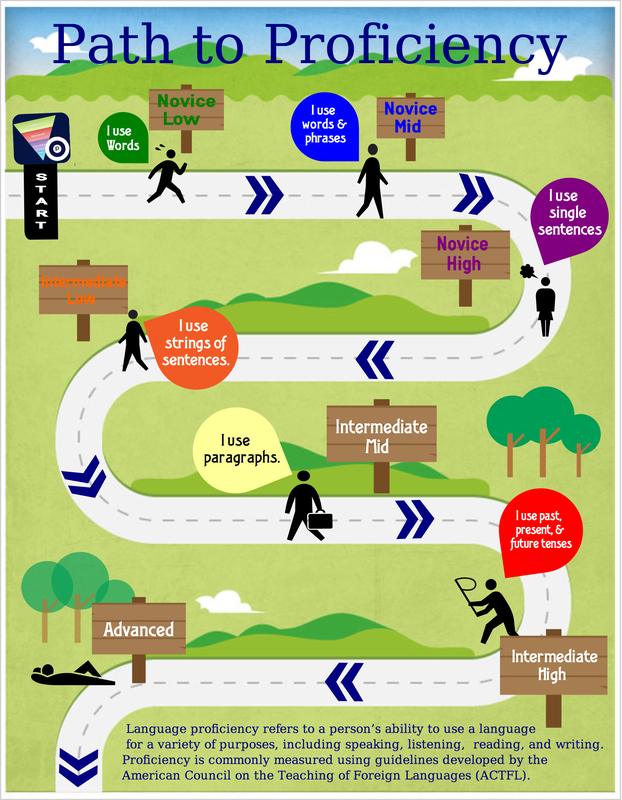 Out of this process came the Path to Proficiency infographic. I am deeply grateful for the inspiration for this idea, and I worked on it almost obsessively until I was able to provide a visual representation to support the idea that language learning is a journey, not a destination. So often students (and parents, too) ask how long until they can expect to become fluent in the language, like there’s some magical step or ceremony after they know a certain amount of words. For students to embrace the role of language learner, on the other hand, means they embrace the notion that learning does not stop after the required two years of language study because when they stop using their language or learning their language they become the people who tell others at parties “I took a language in school and all I can say is “Hi, how are you?” and “my name is…”. This is gut-wrenching for many language teachers, but to me it reinforces the idea of growing in our instruction as well as in our learning. We have more information today then ever before on the process of learning. We know on some level what happens in the brain. We have standards that level the playing field. We do NOT have to figure out WHAT to teach, but rather we have to learn the pace and process of performing toward proficiency therefore tracking performances that lead to our future proficiency targets become critical. 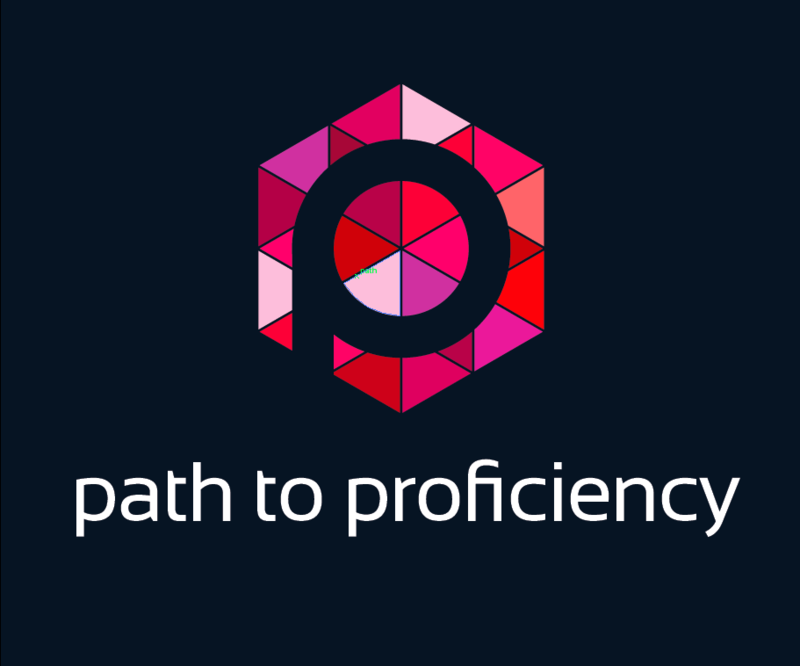 The Path to Proficiency demonstrates the learning progression for students who participate in performance-driven learning experiences. Many times we look at two options as mutually exclusive; we must choose one or the other. Embracing performance and proficiency, though, is NOT an either-or situation. It is NOT “You are a performance-driven teacher” or “You are a grammar-based teacher.” It is not a fact of old school vs. new school teaching methods either. 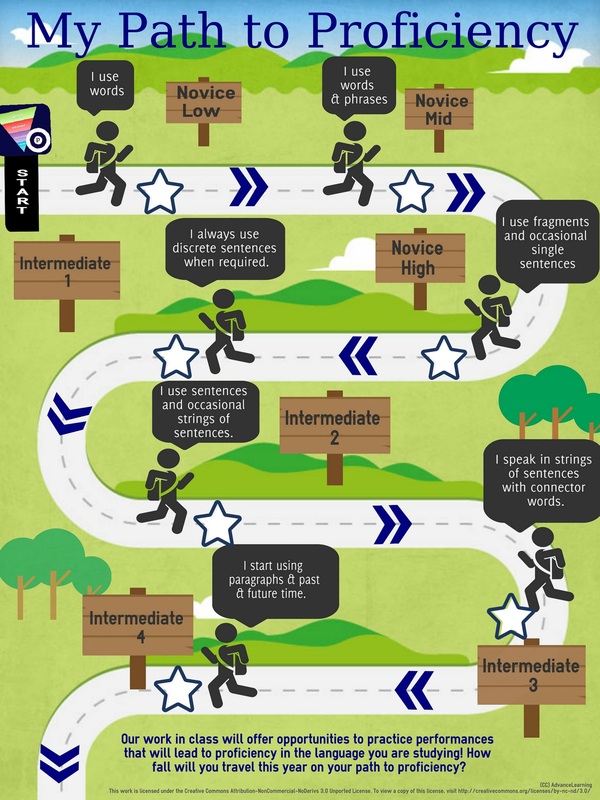 Just like the learners, teachers have to embrace the journey to performance-driven instructional methods. This means we may change how we teach things, the order in which we teach them, and, most importantly, pacing the introduction of new material. It does not mean that we abandon grammar or accuracy, but rather we align it to the proficiency guidelines. It is a departure from courses that are driven and paced by the textbook, and that can be scary. It doesn’t mean we throw textbooks away because textbooks offer resources a performance-driven teacher will use. We cannot create everything from scratch instantly. We have to be discerning consumers using performance as the lens through which we evaluate what and how we teach, as well as which of the available learning tools we use along this path to proficiency. How do you explain or track your progress down the pat to proficiency with your students? How can I purchase a copy of this poster? You can find a hiRes image file at: http://leveluplanguage.weebly.com/performance-feedback-tools.html. Just download it and “take” to any business that makes posters! Best!